Utilities, like any other businesses, are digital. Although there is still plenty of analogue network equipment, most of the important and all new equipment is digital. 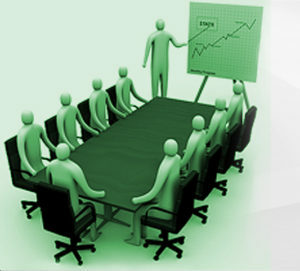 Business processes are supported by advanced computer applications. 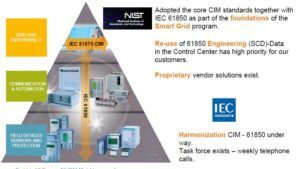 Within this market, IEC-61850 and CIM (IEC-61970 and IEC-61968) are probably the most important, but also huge and complex standards. IEC-61850 defines process-, field- and stations levels, by providing the information model for substations and phasors, plus all distributed energy resources for wind, solar and e-mobility. CIM defines operations-, enterprise- and market levels by providing the common information model for all major TSO/DSO business processes, such as the control center, asset management, configuration management, network modelling, maintenance management etc.. Both standards are now available for a decade, but a still rapidly evolving. Many equipment vendors have implemented parts of the standards to ensure interconnection with other vendors. Some TSOs and DSOs are still reluctant. Many established processes and tools, based on many years of experience need to be redesigned. Often the impact of new standards is bigger than expected. They are not just new protocols, IEC-61850 and CIM are INFORMATION MODELS. With 61850, all equipment supporting this standard can be fully described in a common format/style/language. This structure allows very easy collection, ordering and comparing of all information about the equipment, and its working. Using this model, everything that the device does and logs can be gathered in relational databases for further DATA ANALYSIS. DSO’s and TSO’s are well aware about the incredible opportunities related to big data analyses. For customer management, for asset management, for marketing, for trouble-shooting, network information needs to related with a very large diversity of additional information sets. All these information sets are brought together under CIM (the common information models). International organisations such as ENTSO-E define network codes and communication requirements based on CIM. Xelas Energy provides technology to develop IEC 61850 management. We provide technology to integrate IEC 61850 network data into the business layers.